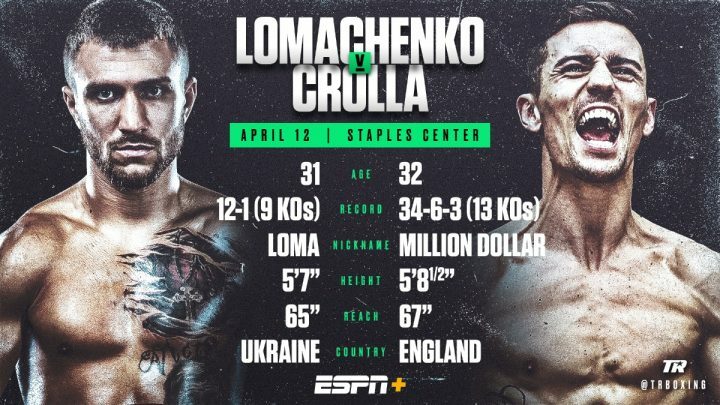 Watch Vasiliy Lomachenko vs. Anthony Crolla Top Rank Boxing on ESPN+ features pound-for-pound boxing king Vasyl Lomachenko (12-1, 9 KOs), as he defends his WBA and WBO lightweight titles against former WBA champion Anthony Crolla (34-6-3, 13 KOs). The card takes place at the Staples Center in Los Angeles, California on Friday, April 12th. So keep watching and enjoy your time..
showdown on PBC on FS1.